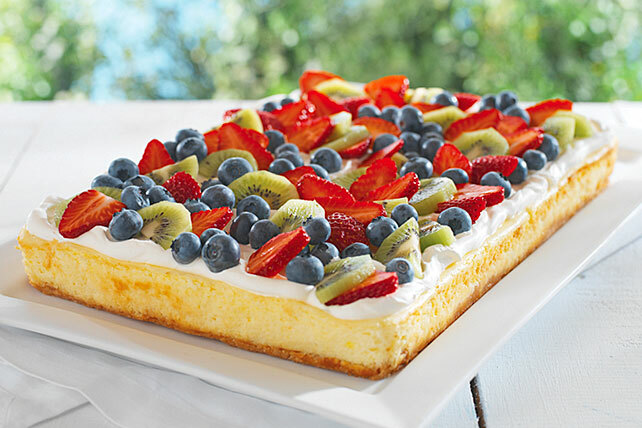 As if cheesecake isn't tempting enough, this potluck all-star sports a layer of whipped topping and 3 cups of fresh fruit bursting with flavor. Line 13x9-inch pan with foil, with ends of foil extending over sides. Combine wafer crumbs, butter and 3 Tbsp. sugar; press onto bottom of prepared pan. Bake 10 min. Beat cream cheese, 1 cup sugar and flour in large bowl with mixer until blended. Add sour cream; mix well. Blend in dry pudding mix. Add eggs, 1 at a time, beating on low speed after each just until blended. Pour over crust. Since this special-occasion cheesecake serves 16, it's the perfect dessert to serve at your next party.